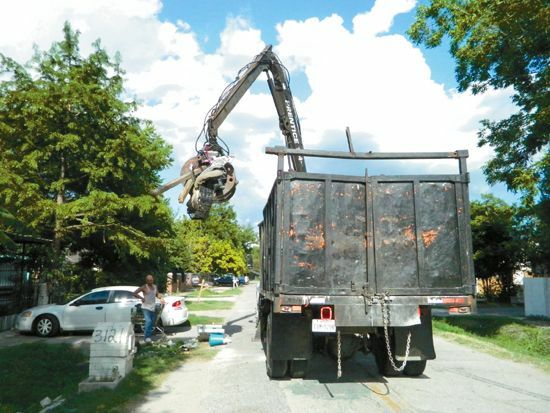 The board of the East Aldine District, after meeting last Monday night and reviewing the costs and results of the Heavy Trash Pick-up program, decided to suspend the work immediately, and instruct residents not to put out any more heavy trash in the four zones designated. East Aldine District president David Hawes reviewed the history and scope of the program for the board. He stated that the contract, which called for monthly payments to the contractor of $13,750 did not cover his costs, for a variety of reasons. These included underestimating the amount of trash that had accumulated since the Pct. 1 program was terminated by the redistricting last year, the inclusion in curbside trash of items other then residential trash, the inclusion of trash at curbside from “dumpers” outside the district, and the large size of trash piles. The contract with OFS Solid Waste had not limited the size or nature of the trash, therefore allowing the overruns to occur, Hawes said. In addition, because Pct. 2 had never picked up curbside heavy trash, even those within the East Aldine District, it became apparent that there were years of accumulated heavy trash that residents were attempting to get rid of. Hawes said that after the first round of pick-ups in the four designated districts, the contractor had disposed of 2500 tons of trash, or 10,560 cubic yards. After 10 weeks, this had grown to 443 truckloads, and the contractor was using large 25 cu. yd. trucks. Due to this overabundance of trash above the original projected amounts in the contract, the OFS Solid Waste company had amassed land fill fees far beyond the monthly payments, and asked the District to assume the costs. The board assessed its options, and reviewed the documentation to assure that the work had actually been done. Therefore, after verifying the accuracy of the claims, they voted an additional $202,000 to be paid to OFS for work completed. However, it was also decided that the current contract was not feasible, and they also voted to terminate the heavy trash pick-up. Trash was due to be picked up in the South zone, and a survey by the staff indicated that most residents had already put this trash out for pick-up. Therefore it was decided that a final cleaning or pick-up would be made in the South zone, subject to the size and type limitations that were announced and published last month. This limited the trash to residential type, not commercial or business trash, and the size limitation is 5 cubic yards, or about 4’ x 4’ x 8’. The District will re-examine how it can pick up trash in the future, and ask for an RFP from interested parties. It is assumed that this pick-up will be more limited in size, and occur only once or twice per year, said Hawes. Precinct 2 has indicated to the District that they will pay $50,000 yearly toward future clean-ups. 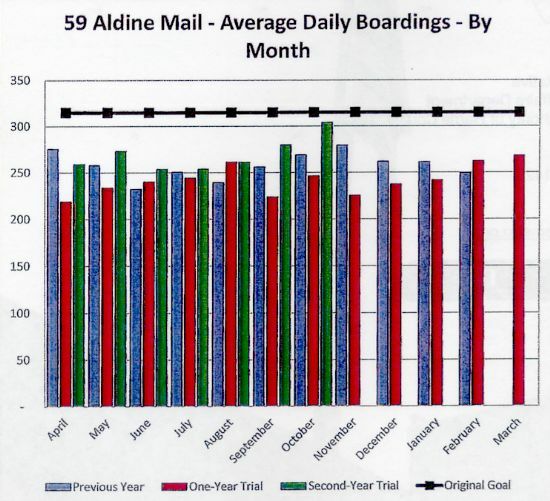 East Aldine District has been advised by METRO that ridership on its Route 59 busline, running on Aldine Mail Route and Airline, and connecting with Routes 6, 56 and 83, has experienced incremental increases in ridership. Boardings in October of this year averaged over 300 per day, almost to the goal of 315 that METRO and EAMD have set for the line in a series of planning sessions throughout last year. Due to this increase, and the smaller buses that have been assigned, METRO has decided that they will increase the frequency of the runs to a 30 minute departure schedule. 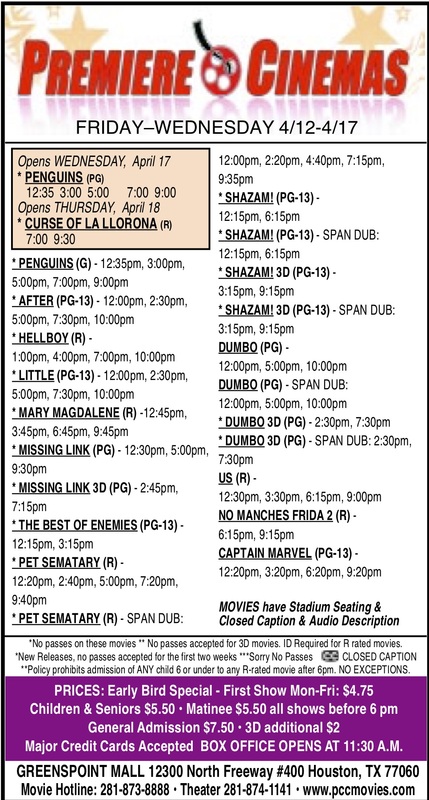 According to Metro’s Jose Pulido, this schedule change will take effect on January 27, 2014. EAMD director of services Richard Cantu stated that this was good news for residents of East Aldine, and forsaw the day when numbers would be even higher, when the new District Town Center and the Lone Star College campus were completed on Aldine Mail Route. At that time the bus service would be an important part of the overall community service plan. Texas Department of Transportation (TxDOT) presented alternatives for widening highways in Houston, during a public meeting last Thursday night, Nov. 14 at Aldine 9th grade school. Since last meeting in October of 2012, alternatives for each segment have change from 8, 15 and 10 alternatives for Segment 1, 2 and 3 respectively to only 3 alternatives for each segment. For Segment 1, for instance, alternative #4 is a 12-lane section, which includes 8 general lanes and 4 managed lanes; and additional right-of-way would be acquired on the West side of I-45. Alternative # 5 is the same 12-lanes (8 general and 4 managed) but this time; additional space would be acquired on the EAST side of I-45. And alternative #7 includes the 12-lanes section with 8 general-purpose lanes and 4 elevated managed lanes on a single structure at the center of the roadway and additional space on both sides of I-45 would be acquired. 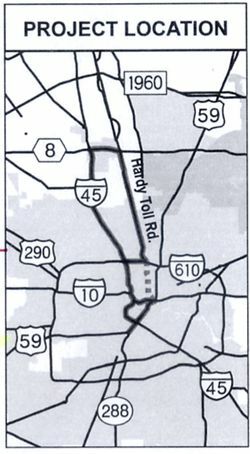 A Hardy Toll alternative was discarded because it would not reduce congestion on I-45 compare to the other alternatives. Officials with the TxDOT said in the report that this project could cost $1.13 billion and it would not be ready to start until 2025. However, residents and businessmen who attended the meeting looked to all alternatives to see which one will have the least impact on their properties. 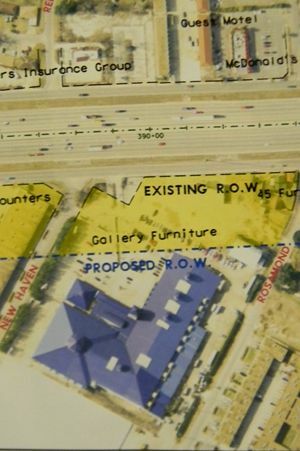 “Look at Gallery Furniture, if they (TxDOT) do this alternative (acquiring space on the East side of I-45), their building would disappear,” said Julian. Nery, also a businessman, has two businesses, each one on either side of the freeway and agrees with Julian. “It would have less impact on the businesses,” said Nery, referring to the elevated lanes alternative. Other residents said they are worried because they have properties along the freeway and they will be affected by the project but “I also know the freeway is a total mess,” said a property owner. “I really do not care, I’m selling my property and moving out to the country,” said a retired man. “I have some land in the country and always wanted to live there. TxDOT is evaluating several criteria such as the impact on businesses and houses in the area, taxes, as well as environmental issues: noise, land use and cultural and natural resources. The next public meeting is today, Tuesday, Nov. 19, at Jefferson Davis High School, Houston, TX. 77009 where the information will be presented again, and the public can leave feedback on reasonable alternatives for highway improvements. All alternatives presented are preliminary and subject to change. The Aldine Noon Optimist is sponsoring a reading competition for local Aldine ISD elementary schools with one boy and one girl winner at each campus. The announcement was done during a luncheon last Wedneday, November 13, 2013. Students earn an entry for every book they read and a drawing is held at the end of the reading competition. The more books they read, the more entries they will have for the drawing. There are 9 elementary schools that receive a boy’s and a girl’s bike for the drawing: Mendel, Orange Grove, Oleson, Francis, Odom, Calvert, Stephens, Johnson and Worsham elementary. 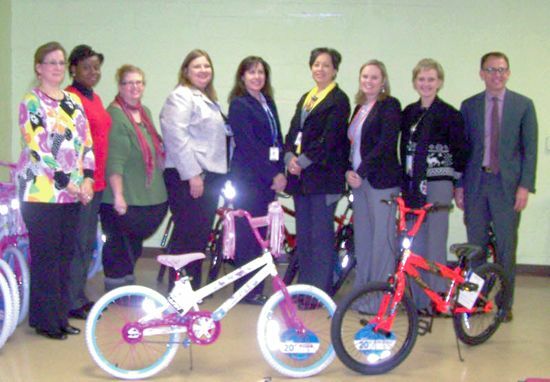 Bicycles were purchased with a grant from East Aldine Management and donation from Prosperity Bank. GREENSPOINT – A dining room decorated with table settings and candelight was the attractive setting for the annual Starlight Business Awards of the Houston Intercontinental Chamber. The event was held last Thursday evening, at the Hilton Hotel Greenspoint, with about 150 chamber members and business persons attending. The title sponsor was Noble Energy, with 14 additional corporate sponsors. After opening remarks, Chamber president Reggie Gray gave an annual report of chamber activities, accomplishments, and goals for the coming year.He reported that there were 600 company members, and 3000 social members in the chamber. His report on activities relied heavily on corporate partnerships and foreign contacts that have developed. After the report, the new board members were sworn into office by president Heather Dunagin. The board has 34 business representatives, of which 15 were present for the ceremony. 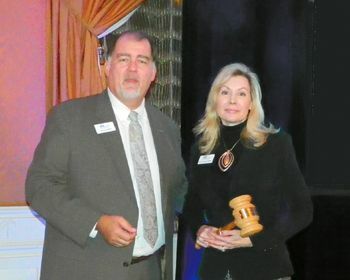 — Pinnacle Award, special friends of the Chamber, went to Sidney Evans, Bill Pilkington, Autumn Knight, and Bill Wilson. Aldine Sheriff’s Storefront in Harris County is the first permanent location to have a drop-off box for expired or unused drugs. Back in September 26, 2012, Sheriff Adrian Garcia, the Harris County Sherrif’s Office, the Drug Enforcement Administration (DEA) and other entities announced the permanent location at 5202 Aldine Mail Rt. 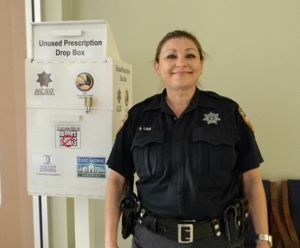 Since then, Aldine Storefront has collected enough unused medications to fill two trash cans (of 32 gallons), said Deputy Grace Luna, responsible for the drop-off box of unused drugs in Aldine. Deputy Luna also mentioned that the DEA has gone two times to collect and discharge drugs properly. –Unused or expired prescription medications can cause accidental poisoning, overdose and abuse. –Pharmaceutical drugs can be just as dangerous as street drugs when taken without a prescription or a doctor’s supervision. –The majority of teenagers abusing prescription drugs can get them at the home medicine cabinet. –Unused prescription drugs thrown in the trash can be retrieved and abused or illegally sold; drugs that are flushed, contaminate the water supply. Help save lives and protect the environment by using the drop-off box for your unused drugs at the Aldine Storefront. 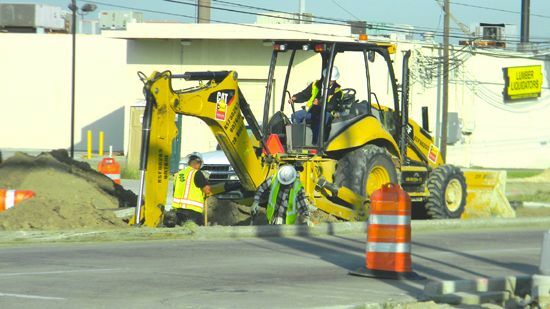 NORTH HOUSTON–The Texas Department of Transportation (TxDOT), in cooperation with the Federal Highway Administration, will hold public meetings for the North Houston Highway Improvement Project. The project limits are from the interchange of US 59 and SH 288 to the interchange of I-45 and Beltway 8 North. The study area includes portions of I-10, US 59, and SH 288 near downtown Houston; Hardy Toll Road from north of downtown Houston to Beltway 8 North; and I-610 and Beltway 8 North between I-45 and Hardy Toll Road. The purpose of the meetings is to present information about, and received public feedback on, reasonable alternatives for highway improvements in the North Houston corridor; the alternatives evaluation process; and how community feedback has been incorporated in the planning process. The same information will be presented at both meetings. Materials will be in English with some materials also in Spanish. Spanish-speaking project team members will be available to talk with Spanish-speaking attendees. After the meetings, the information will be available for review and reproduction at www.IH45NorthandMore.com and at the TxDOT Houston District Office located at 7600 Washington Avenue, Houston, Texas 77077. The meetings will be held in an open house from 5:30 pm to 7:30 pm. Thursday, November 14, 2013 at Aldine 9th Grade School, 10650 North Freeway, Houston, TX 77037. Tuesday, November 19, 2013 at Jefferson Davis High School, 1101 Quitman Street, Houston, TX 77009.
by e-mail to HOU-piowebmail@txdot.gov, by mail to: Director of Project Development, Texas Department of Transportation, P.O. Box 1386, Houston, TX. 77251-1386. Comments should be e-mail or postmarked by December 6, 2013.